I am so excited to share this finished project with you guys! 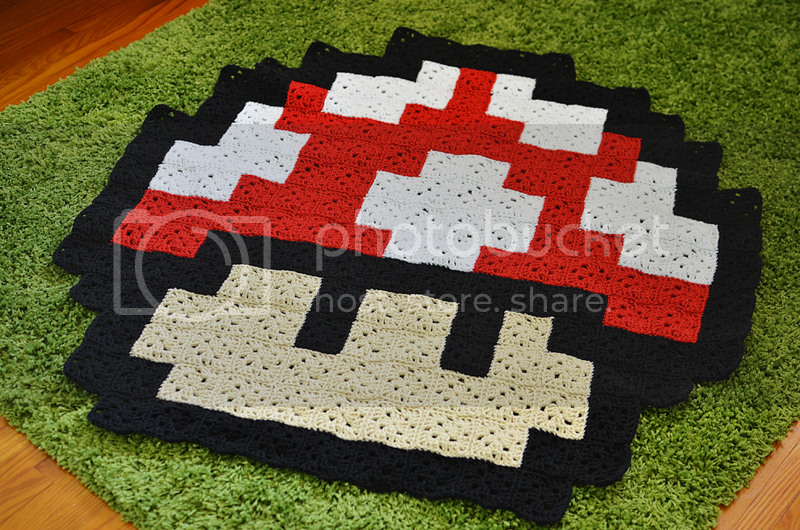 A few years ago Becky posted about a pixelated Mario mushroom blanket and I thought it was the coolest thing ever. Fast forward to our friends having a baby in January and decorating his room Super Mario style. Then fast forward about 5 months later when I finally finished this gift for them. I am so happy with the way this blanket/floor covering turned out. I say blanket/floor covering because really, you can use it as either. I found the pattern over here on Pixelated Mushroom. I used my own granny square pattern but used the provided grid to know how many of each colour to make and the pattern to attach them in. 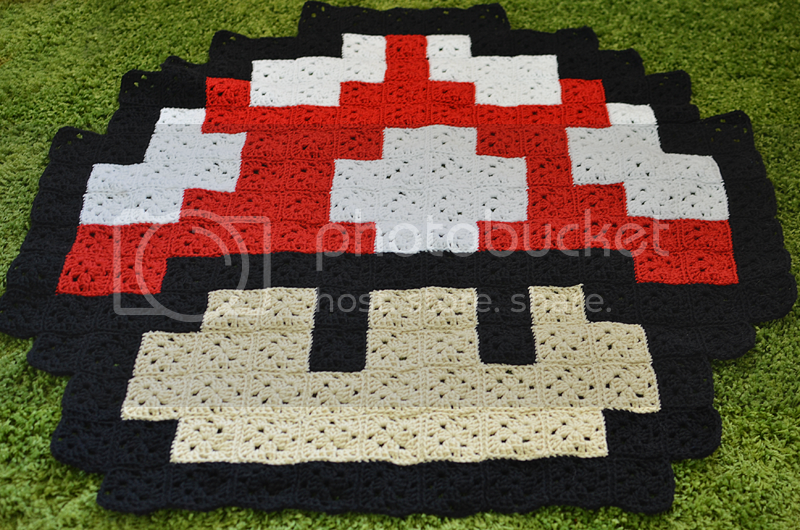 This crochet Mario mushroom is one of my favourite things that I've made! It took quite a long time but it was totally worth it. Wow, that is so awesome! What a great gift! Oh my gosh, I love Mario! I want this blanket. It would be awesome if your friend would let you share the room with us. Super cute! I am jealous of your crochet prowess. So awesome!! I need to make one for myself. Oh my gosh! That is AMAZING! Great job!! THIS IS SO COOL! So inspired to make one now. You did an amazing job with this! That is all kinds of awesome! I am definitely going to check out that pattern and maybe make one for myself. this is too cool! it came out so well. 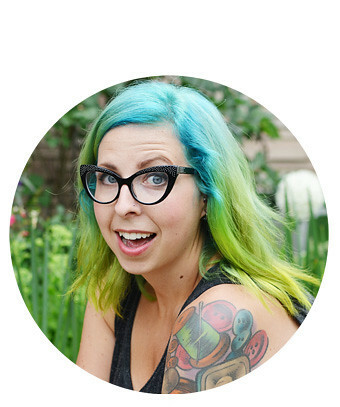 I'm really loving your blog! I've always wanted to make one of these. They look so awesome! This is awesome! My brother is a total gamer geek and he would love one of these. I might have to get cracking on one for his next birthday. Oh my goodness, this is SOOO cool! You did such a great job! this is super amazing, must learn how to crochet now! This is super amazing! I may have to try a project like this myself, although i will probably get half way through and forget about it. I am notorious for half finished projects! You did a really wonderful job! That. Is. Amazing. 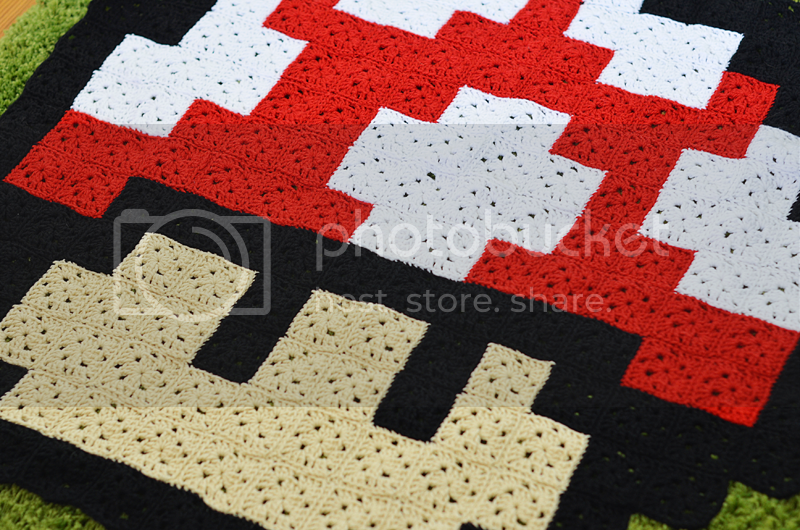 I'm currently working on a crocheted Tetris blanket. There should be a forum for us all to share our gaming craftiness! Congrats on the blanket ^_^ Glad the chart was useful. Nice to see more mushrooms! What pattern do you use for your granny squares? I really want to make this, but I like to look of your granny squares compared to the other person's tutorial. I can't wait to make this!! I bet it would look wonderful with regular crocheted squares too! !